Running Footer: Video-monitoring grassland bird nests-Pietz et al. In the 1990s, the plight of grassland birds received increased attention (Johnson and Schwartz 1993, Knopf 1994, Johnson and Igl 1995), as researchers began to recognize that grassland species were showing "steeper, more consistent, and more geographically wide-spread declines than any other behavioral or ecological guild" of North American birds (Knopf 1994:251). Many grassland passerine populations had been declining for decades (Peterjohn and Sauer 1993, Herkert 1995, Igl and Johnson 1997), and it was thought that high rates of nest predation could be contributing to these declines (Basore et al. 1986, Martin 1993). At that time, there were few data on the identity of nest predators of grassland passerines. Predator sign at grassland duck nests had been studied intensively (Sargeant et al. 1993, 1998); however, at passerine nests, assignment of nest fates and identity of predators were usually based on assumptions (Best 1978, Wray et al. 1982, Vickery et al. 1992). Often, when a passerine nest was revisited, only an empty bowl remained, with few or no clues as to what had happened (Hussell 1974, Major and Gowing 1994). Determining fates of grassland bird nests by direct observation generally is not feasible. Nests of many species of grassland birds are well hidden in vegetation, making it difficult or impossible to view nest contents from a distance, and are in open terrain, making unobtrusive observation a challenge. Predator communities often include both nocturnal and diurnal nest predators, which would require 24-hr surveillance. Identifying fates and predators of active grassland passerine nests could not be adequately addressed using artificial nests, still cameras, or conspicuous equipment (Pietz and Granfors 2000a). The need for a new tool was evident. In 1996, Pietz and Granfors (2000a) began testing a video surveillance system (hereafter camera system) specifically designed to monitor grassland passerine nests. This first system used a black-and-white camera, about 4 ? 4 cm on each side, with infrared (940-950 nm) light-emitting diodes (LEDs) to cryptically illuminate the nest area at night (Fig. 1.1a). Cameras had to be very close to the nests (typically <30 cm) to record activity at the nests and the fate of nest contents without vegetation obstructing the view (Fig. 1.1b). Cameras, in waterproof housings, were made as small as possible to minimize disturbance to the nesting birds and to avoid attracting other animals. The camera angle and placement were adjusted at the nest with the aid of a handheld video monitor (Fig.1c). The camera was connected by cable to a time-lapse video-cassette recorder (VCR) and battery (Fig.1d) about 40-50 m away. VCRs were set to record continuously and capture about 4 images/sec because early trials showed that some predation events took only a fraction of a second. At this recording speed, videotapes had to be changed (Fig.1e) daily. The person changing the tape connected a handheld video monitor to the VCR (Fig. 1.1d) to determine (with reasonable certainty) if the nest was still active, thus eliminating the need to physically revisit the nest. The camera was left in place until the nest failed or succeeded (i.e., fledged young). Camera systems were deployed as far apart as possible within and among study sites to reduce the chance that individual predators with large home ranges (e.g., fox [Vulpes spp. ], coyote [Canis latrans]) would encounter more than one nest with a camera. From the mid-1990s through the early 2000s, these or similar camera systems were used in a variety of grassland bird studies (Winter et al. 2000, Renfrew and Ribic 2003, Klug 2005, Grant et al. 2006). The purpose of this paper is to use this body of work and papers in this volume to provide an overview of the contributions these camera systems have made to the understanding of grassland bird ecology. We include updated test results for some of the questions explored with smaller data sets by Pietz and Granfors (2000a). With these sources of information, we address the following topics: fates of nests, eggs, and nestlings; predator identification and predator ecology; standard methods of data collection and analyses; predator behavior and predator-prey interactions; and parental and nestling behaviors. We close with caveats related to the use of cameras at nests and the interpretation of data collected with camera systems. Studies using video nest surveillance (hereafter camera studies) confirmed that predation was the leading cause of nest failure for grassland passerines (Pietz and Granfors 2000a, Klug 2005, Renfrew et al. 2005, Ribic et al., chapter 10, this volume). In addition, video data revealed that some successful nests (i.e., at least one young fledged) lost part of their contents to predators (i.e., partial predation) (Pietz and Granfors 2005). Results from studies in North Dakota and Minnesota showed that predation not only accounted for most nest losses (Table 1.1) but also was the leading cause of mortality among nestlings (Table 1.2). Camera studies revealed that partial predation sometimes led to nest abandonment by the parents [e.g., in Northern Bobwhite (Colinus virginianus) (Ellis-Felege and Carroll, chapter 3, this volume)]. This also occurred at some passerine nests subjected to cowbird parasitism and removal of host eggs (Hill and Sealy 1994, Romig and Crawford 1995). Video data allow researchers to link proximate events (e.g., egg removal) with nest fates; however, classifying such nests may then become ambiguous using current terminology. For instance, in the examples above, should the cause of nest failure be considered predation or parental abandonment? Parental abandonment also may be caused by deployment of cameras near nests, particularly during the egg stage (Pietz and Granfors 2000a). Nest abandonment that occurred <1 day after camera deployment was assumed to be induced by the nesting birds' intolerance for the presence of the camera, the disturbance caused while setting up the camera system, or both. In a sample of passerine nests from 1996-2001, 31 of 37 abandonments occurred within 1 day of camera deployment and, thus, were considered to be camera induced (Table 1.1). In the 1996-2001 sample, nearly 22% of 137 nests were abandoned within 1 day when the camera system was deployed during egg laying or incubation; only one such abandonment occurred (<2%) among 51 nests when the camera system was deployed during or after hatch. Nest failures attributed to cameras are discussed in the "Caveats" section. In addition to predation, video surveillance revealed factors leading to nest failure or loss of eggs or nestlings that may have been misclassified as predation in the absence of video data (Pietz and Granfors 2000a). For example, two Clay-colored Sparrow (Spizella pallida) nests in small shrubs gradually tipped over as the nestlings grew, and the nestlings suddenly fell out. Unless the nestlings were still present (e.g., on the ground) when the observer returned to check the nest, the observer would have found only an empty, disheveled nest that appeared to have been torn from the shrub by a predator. Video data also showed that some nestlings left the nest prematurely, seemingly on their own accord (here we define "prematurely" as earlier than expected based on fledging ages from undisturbed nests). For example, at a camera-monitored Savannah Sparrow (Passerculus sandwichensis) nest in Minnesota, a small plains gartersnake (Thamnophis radix) attempted to remove 7-d-old nestlings but failed. One nestling left the nest during the snake's visit and the remaining four nestlings departed within the next 1.5 hr. 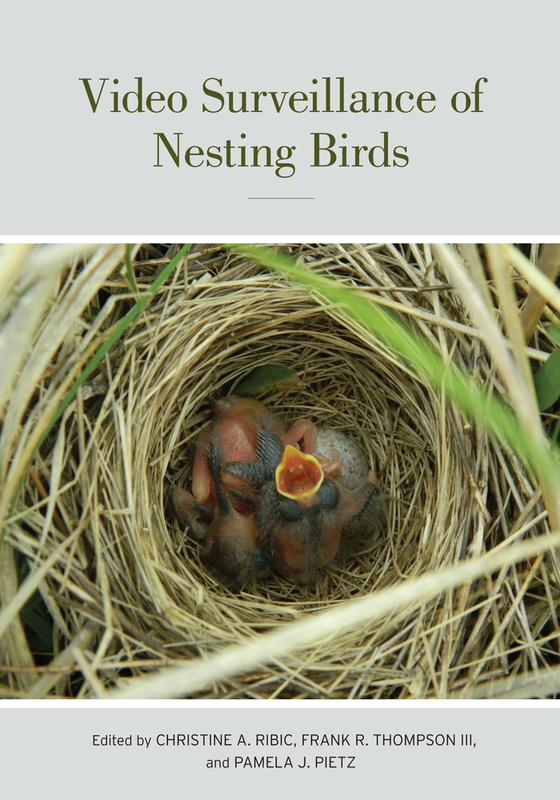 Video data from undisturbed nests showed that Savannah Sparrow nestlings usually do not fledge until they are 9-10 days old (Pietz et al., chapter 4, this volume). Many cases of "forced fledging" (sensu Pietz and Granfors 2000a) took place while a predator was still at the nest. In such cases, the young were clearly motivated to leave the nest by the presence of the predator, but classifications of nest and nestling fates remain ambiguous. At one Savannah Sparrow nest in North Dakota, a 7-d-old nestling fled the nest while a white-tailed deer (Odocoileus virginianus) was eating its nest mates (Pietz and Granfors 2000b). Technically, the young bird that left the nest would have been considered a fledgling. In this case, however, the fate of the "fledgling" was known because the deer caught it while it was still in camera view; it survived <10 sec outside the nest (Pietz and Granfors 2000b). Forced fledging occurred at nearly 20% of our nests that were visited by predators and accounted for about 10% of young that were classified as fledged (Table 1.2; Pietz et al., chapter 4, this volume). People checking nests also can cause premature or forced fledging. In one case, three Clay-colored Sparrow nestlings stayed still while an observer was at the nest, but they all left the nest less than a minute after the person departed (table 3 in Pietz and Granfors 2000a). How forced fledging affects survival of those individuals is seldom known. Certainly, if nestlings are sufficiently ambulatory, forced fledging may be advantageous for nestling survival (Lima 2009). Camera studies have revealed that the determination of nest fates is not always as clear cut as depicted in the literature. As more studies collect nest data using video, researchers may need to set new standards for terminology and for classifying nest and nestling fates. Researchers have investigated many factors that potentially affect nest predation. In this extensive literature, there are studies that draw opposite conclusions regarding the effects of just about every factor tested - including nest concealment, nest stage, habitat edge, and landscape characteristics (e.g., references in Pietz and Granfors 2000a, Jones and Dieni 2007). One likely explanation for these conflicting results is that the predator communities differed among studies. Before we can understand the ecological factors and underlying mechanisms that govern nest predation, we must first know who the predators are (Lahti 2009, Weidinger 2009, Benson et al. 2010, Weidinger 2010, Thompson and Ribic, chapter 2, this volume). Video surveillance at nests has helped researchers to do this. Camera studies have revealed a surprising diversity of predators at grassland passerine nests. For example, in the North Dakota and Minnesota studies (1996-2001), there were 16 different predators identified to the level of genus or species, including 11 mammals, four birds, and one snake (Table 1.3). Similar levels of diversity were found in other grassland studies (Table 1.4; Davis et al., chapter 14, this volume). In addition to confirming culpability by species assumed to be nest predators, camera studies have documented unsuspected nest predators, such as jumping mice (Zapus spp.) and white-tailed deer (Pietz and Granfors 2000a, b) and cattle (Bos taurus) (Nack and Ribic 2005). Video data have allowed researchers to start exploring how nest predator communities vary at multiple spatial scales. Grassland camera studies across several states, from Wisconsin to Montana and south to Nebraska, have illuminated some regional similarities and differences in predator communities (Table 1.4). Unsurprisingly, raccoons (Procyon lotor) were documented more often at eastern study sites (e.g., Renfrew and Ribic 2003), where the mix of row-crop agriculture (particularly corn [Zea mays]) and woodlands provides quality habitat for raccoons (Dijak and Thompson 2000). Some differences in predator communities reflect latitudinal ranges of taxa. For example, in the more northerly grasslands (Montana, North Dakota, and Minnesota), snakes accounted for less than 5% of nest predation events in which predators were identified, and these all were by gartersnakes (Thamnophis spp.) (Table 1.4). Farther south, however, the number of snake species and the proportion of snake predations increased markedly. For instance, in Nebraska and Iowa, snake species accounted for more than one-third of nest predations (Table 1.4). The disparity in prevalence of snake predation between cool and warm climates has been documented beyond grasslands (King and DeGraaf 2006). At smaller spatial scales, researchers are just beginning to investigate how predator communities differ among different grassland habitats (Ribic et al., chapter 10, this volume). Understanding how predator communities vary spatially can be used to help guide grassland bird conservation efforts (Thompson and Ribic, chapter 2, this volume). Predator communities also can vary temporally, such as across seasons and years. On an extremely long temporal scale, distributions of some snake species and other nest predators that are currently limited by temperature (e.g., fire ants) may change as a result of warming associated with climate change. At the opposite extreme, video surveillance has allowed researchers to examine predation at much finer temporal scales by pinpointing the exact time that predation events occur. This information has prompted new ways of looking at predation ecology. Knowing the time of predation allows researchers to explore differences between nocturnal and diurnal nest predators. For example, predators hunting during the day have more visual cues available to them, whereas nocturnal predators probably rely more on scent. This led us (the authors) to expect that diurnal predators would find nests with open bowls more easily than nests with covered bowls, but that nest type would be less likely to matter to nocturnal predators. To test this, we determined the time when a predator first removed (or destroyed) an egg or nestling from a nest. We called this the "initial predation" (sensu Pietz and Granfors 2000a) and, because it likely reflected conditions under which the predator found the nest, we used it as a measure of predation risk. We calculated separate rates of initial predation for day and night, using nest data from our North Dakota and Minnesota studies (1996-2001). As predicted, open nests tended to be more vulnerable than covered nests during the day, but at night predation risks (i.e., initial-predation rates) for the two nest types were similar (Fig. 1.2). The same result was found in an earlier analysis using just 1996-1997 data (Pietz and Granfors 2000a). In that paper, daily predation rates also were reported for nearly 300 nests that were monitored without video surveillance (i.e., non-camera nests); no difference was detected between open and covered non-camera nests (?21 = 0.00, P = 0.98), suggesting that predation risk associated with nest cover may only be detectable if diurnal and nocturnal predation can be separated. The ability to separate diurnal and nocturnal predation events may contribute to deciphering ecological phenomena in unexpected ways. For example, when Roper and Goldstein (1997) tested the Skutch hypothesis that activity at nests increases nest predation risk (Skutch 1949, 1985), they expected to find greater nest predation rates during the nestling stage than during incubation. They found higher frequencies of nest visits by adult birds during the nestling stage than during incubation, but daily survival rates did not differ between the two nest stages. They surmised that this lack of support for the link between nest activity and predation could be explained by the previously unrecognized importance of predation by a nocturnal mammal, which they assumed did not use bird activity to locate nests. Now video data can be used to help assess the relative importance of nocturnal versus diurnal predation and to test hypotheses related to activity at nests (e.g., Muchai and du Plessis 2005). Knowing the time of predation also allows researchers to explore whether brood age affects predation risk. We tested some of these ideas with nest data from our North Dakota and Minnesota studies (1996-2001). We used initial-predation rates as a measure of predation risk and used brood age as a surrogate for daytime activity at the nest. We expected daytime initial-predation rates to increase with brood age, because some studies have shown that daytime activity of parents and nestlings tends to increase as nestlings grow (e.g., provisioning rates increase with brood age: Goodbred and Holmes 1996, Dohms 2009). We did not expect nocturnal initial-predation rates to increase with brood age, however, because activity at the nest, at all brood ages, typically ceases at night (Roper and Goldstein 1997; Authors, unpubl. data). In our sample, nestlings were more likely to be depredated during the day than at night, but we did not find an increase in initial-predation rate with brood age for either day or night (Fig. 1.3; day: rs = ?0.07, P = 0.85; night: rs = 0.20, P = 0.57). Our sample for some brood ages may have been too small to test for this pattern, or the assumption that activity at the nest increases all the way through fledging age may not be true (e.g., see Adler 2010). Video data can be used to examine this assumption, for example, by quantifying adult visits to nests as the nestlings age. Note that we lumped several species in our analysis because of small sample sizes, but we recognize that activity (e.g., provisioning rates) may not relate to nestling age in the same way for all species. In any case, the hypothesis that brood age affects vulnerability to predation needs further testing. Video surveillance has helped researchers evaluate several standard methods used to study nesting biology, including those used to assign nest fates, causes of nest failure, and (for depredated nests) types of predators. The standard way of determining nest fate is to visit the nest every few days, and use nest contents, sign at the nest (including condition of the nest and nest vicinity), and behavior of parent birds to decide if the nest was successful. Earlier video data showed that initial-predation rate tended to increase with nestling age (Pietz and Granfors 2000a) and many nests were depredated when nestlings were close to fledging age (Pietz and Granfors, unpubl. data). At this stage, depredated and fledged nests may be impossible to tell apart. Even the behavior of parent birds can be misleading. Pietz and Granfors (2000a, unpubl. data) found that parents continued to visit their nests, often carrying food, for several hours after all nest contents had been removed by predators (Fig. 1.4). Visitation rate dropped off quickly, but some parents were still attending nests nearly a day later. Pietz and Granfors (2000a) therefore suggested that researchers check adult behavior on more than 1 day if it is used as the basis for classifying nest fate. Video evidence indicated that some nests failed for reasons other than predation, but the cause of failure might be misconstrued as predation to an observer doing periodic nest checks. For example, when nestlings died at a young age, video showed that the parents sometimes removed the carcasses from the nest (Pietz and Granfors 2000a, Kirkpatrick et al. 2009), resulting in the appearance of predation or partial predation. Another example (Pietz and Granfors 2000a, unpubl. data), involving a Western Meadowlark (Sturnella neglecta) nest in North Dakota, illustrates how difficult it can be to correctly assess cause of failure from nest checks. The meadowlark adults left their five-egg clutch unattended for several hours following human disturbance near the nest site. Then a Brown-headed Cowbird (Molothrus ater) entered the nest bowl, tossed three eggs out of the nest, and punctured holes in the other two eggs. That night, insects scavenged contents from those two eggs, and the following night a red fox (Vulpes vulpes) scavenged the remaining egg contents (and likely removed the three eggs that the cowbird had tossed outside of camera view). When Pietz revisited the site, the only remains were two eggs shells that looked similar to those known to have been depredated by small mammals (Pietz, pers. obs.). Prior to camera studies, numerous authors claimed to be able to identify types of nest predators based on the condition of the nest after predation (e.g., Best 1978, Best and Stauffer 1980, Wray et al. 1982, Hoover et al. 1995, Patterson and Best 1996, Christman and Dhondt 1997). Pietz and Granfors (2000a) found that none of their generalizations were valid in North Dakota grasslands. No sign was left at most nests, including those depredated by large mammals. Furthermore, Pietz and Granfors (2000a) found considerable variability within species and overlap among species when they did leave sign (see also Sargeant et al. 1998). Sign can be misleading as well as ambiguous. In Minnesota, for example, a Savannah Sparrow nest from which a four-egg clutch disappeared was found to be surrounded by deer tracks when the nest was checked, but the videotape showed that the eggs had been removed by a male Northern Harrier (Circus cyaneus) (Pietz, unpubl. data). Thus, even when sign appears obvious, it may lead to the wrong conclusion. Many other camera studies, in several habitats and ecosystems, have shown that sign is unreliable for assigning predator types at passerine nests (e.g., Thompson et al. 1999, McCallum and Hanson 2001, Williams and Bohall Wood 2002, Liebezeit and George 2003, Thompson and Burhans 2003) and non-passerine nests (Ratz et al. 1999, MacDonald and Bolton 2005, Coates et al. 2008, White et al. 2010). Some variation in damage by predators might be related to nest height. In North Dakota, for example, a Buteo hawk ripped a Clay-colored Sparrow nest out of a small shrub, completely destroying the nest (Pietz and Granfors 2000a, unpubl. data). Hawks did not appear to damage any of the six ground nests from which they removed eggs or young (Pietz, unpubl. data). Nest predators, in general, were less likely to damage nests that were on the ground than nests that were above the ground (Pietz and Granfors 2000a). This makes sense, given that nests on the ground are easier to reach for most predators and have more structural support than nests that are off the ground and attached to vegetation. As suggested in an earlier section, video nest surveillance has allowed a new approach to the study of predation risk. The use of initial-predation rate provides a better measure of predation risk (e.g., relative to nest stage, nestling age) than does daily survival rate or daily predation rate (Pietz and Granfors 2000a). Daily survival rate is affected by sources of nest loss other than predation and can be affected by misclassified nest fates. The standard daily predation rate (which we refer to as final-predation rate) only includes nests that have lost all their contents and is associated with the time and conditions when loss of the last viable nest contents was detected. Initial predation, on the other hand, more likely coincides with the time and conditions under which a predator first discovered the nest. If partial predation is common, the initial- and final- daily predation rates could be substantially different. Video nest surveillance also has provided a means to verify natural fledging ages (Pietz et al., chapter 4, this volume). For most species, fledging ages published in the literature (e.g., Ehrlich et al. 1988, Baicich and Harrison 1997) are based on data from researchers visiting nests. However, as mentioned earlier, video data have shown that fledging can be precipitated by a nest visit (e.g., table 3 in Pietz and Granfors 2000a). If researchers underestimate average fledging ages, it could cause them to conclude that failed nests had fledged and, thus, overestimate nest survival. Video surveillance also offers a means to evaluate impacts of researcher activities at nests. For example, video could allow researchers to gauge parental reactions to markers used on nestlings and data-collecting devices placed in nests (e.g., artificial-egg thermistors or camera triggers). Some studies already have used nest video for such purposes. For example, Fisher et al. (2010) documented that adult Sprague's Pipits (Anthus spragueii) pulled some radio-marked nestlings from their nests while attempting to remove the nestlings' transmitters. Little et al. (2009) used video data to assess the response of adult Bobolinks (Dolichonyx oryzivorus) to neck ligatures on their nestlings. Ibáñez-Álamo and Soler (2010) identified nest-predator communities at their study sites with nest video, then used this information to develop an appropriate experimental design to evaluate effects of nest visits by researchers on predation rates. Contrary to traditional ideas, they demonstrated that investigator activities can reduce nest predation. Declining bird populations, especially those that breed in North American grasslands, have stimulated extensive research on factors that affect nest failure and reduced reproductive success. Until now, this research has been hampered by the difficulties inherent in observing nest activities. Video Surveillance of Nesting Birds highlights the use of miniature video cameras and recording equipment yielding new important and some unanticipated insights into breeding bird biology, including previously undocumented observations of hatching, incubation, fledging, diurnal and nocturnal activity patterns, predator identification, predator-prey interactions, and cause-specific rates of nest loss. This seminal contribution to bird reproductive biology uses tools capable of generating astonishing results with the potential for fresh insights into bird conservation, management, and theory. Christine A. Ribic is Associate Professor of Wildlife Ecology at the University of Wisconsin, Unit Leader, US Geological Survey, Wisconsin Cooperative Wildlife Research Unit. Pamela A. Pietz is a Research Wildlife Biologist in the Northern Prairie Wildlife Research Center of the USGS in Jamestown, North Dakota.